PewDiePie’s Tuber Simulator APK has been released so we can play the latest version 1.5.0 on Android. In this game, you are given the opportunity to realize your dreams become the number one online video creators. Yes, through a casual game that carries the name PewDiePie, you will explore the struggle of how difficult a career as a professional online video creators in small rooms with a few equipment. 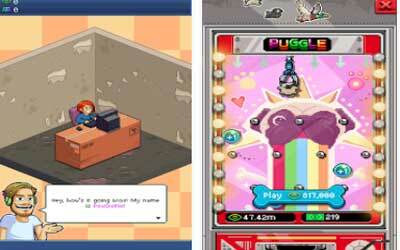 Besides busy producing videos and beautify your office room conditions, this game also features a mini game called Puggle involving PewDiePie’ beloved dog, that Edgar and Maya. Another part that makes me love this game is how Outerminds as the developer still retains the charming pixel graphics as well as on their previous game, namely Legend of Brofist. Gameplay in this game is pretty easy. You will be guided by the PewDiePie character located on the left side of the screen. With a distinctive voice, you’ll get an explanation so you will not feel any difficulty while playing. You should increase the viewers and subscribers. We can create a video that is in accordance with the trend at the time. In addition we also have to decorate your work space so you can get viewers and subscribers easily. This game is free for everyone and now it’s very popular. Just in a few days it gets many downloaders. If you are a fan or maybe just interested in unique entertainment that lifts the life of an online video creator, then PewDiePie’s Tuber Simulator is a game that I recommend this week. Pewds really made a good game and I love it that I became addicted to the game instantly! It is very fun, the gameplay is fun and there are a variety of items. This game makes sure you are always doing something. While you are waiting for a video to finish you can edit your room, and while you are waiting for items to ship you can also play Puggle to help pass the time (it also rewards you with less shipping time).